Is a password that you use actively to protect an account secure? The question is difficult to answer as it depends on your definition of secure. Secure can mean, among other things, that it cannot be cracked in reasonable time, or that it is not already on a publicly accessible password list. 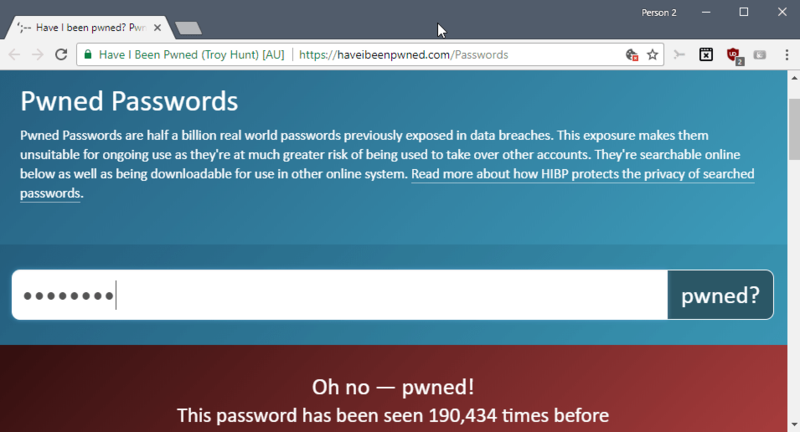 The Pwned Passwords database of Have I Been Pwned has been updated recently with new password data sets. The service accepts a password and reveals whether it was found on any of the lists that powers the service's database. All you have to do is type a password to find out whether it is available in the clear-text format on a public password dump list. Some users may have reservations when it comes to typing passwords that they use on a site on the Internet. That site, in theory, could use the information for malicious activity. While it requires a username, usually that goes along with it, adding the password to a list to run dictionary attacks against services could have negative consequences for the user who entered it on the site. That's one reason why you may download the entire database to your local system. It is available as a zipped torrent file; the torrent file has a size of 8.8 Gigabytes and contains a list of 501 million password hashes and password use counts. The archive extracts to a single 30 Gigabytes large text file that many text editors won't open. Use a free program like Large Text File Viewer to open the text document on your system. You need to compute the SHA-1 hash of your passwords and may use a free program like HashCalc for that which supports the computation of hashes from text strings among other things. You'd then search the downloaded database file for that Sha-1 hash to find out if the password leaked before. Attackers may use public password lists in attacks, especially if passwords are popular. If a password is found in the database, it is advised to change it and use a password that is not found. Generally speaking, it is best to assume that any password that is listed in the database is known to attackers and should not be used anymore. Now You: How do you make sure to select secure passwords for accounts? You may use the updated Pwned Passwords database to find out whether the passwords that you use actively are on public password database lists on the Internet. I’m not pasting my passwords into any site but the one I wish to log in to. However, I am grateful that this website exists to check my email for pwnage. So thanks for that. I use Keepass and change my passwords regularly. I’d love to know, but this is counter-intuitive to everything I’ve learned about security. That’s a fully reasonable position (and one that I share). This service appears to be trustworthy, but nobody should expand their attack surface regardless of how trustworthy the service is if there isn’t a good reason to expand it. As I see it, the utility of this service is really for people who have poor password habits — namely, people who use the same password with multiple services/sites. If you are strict about never reusing passwords, then this service is of limited value. So my recommendation is: generate a new (and completely random) password for each site and service you use. If you’re unwilling to do that, then this service is actually important, so that you have an indication that you need to go change the passwords for all the other sites/services that use the same one. Entering your password in a site like this puts your password in a list that potentially could be used for brute force attacks. Hackers are so resourceful. Instead of creating their own lists, they masquerade as a password checking facility, and get everyone else to add words to their list. I tried my WLAN and router’s passwords there, I was curious. WLAN: Good news — no pwnage found! Interestingly enough, in my mind, the pass that I set for my router is stronger than the one I set for my WLAN. I won’t try any of my accounts passwords, even though I am aware of who Troy Hunt is. Still, interesting.. Interesting to find that my old password I used to use everywhere (terrible practice) has not been leaked :) It was a relatively unsafe password, but it wasn’t a word. Remember: you shouldn’t be able (or need) to remember your passwords. Who, me? :) I use unique 32 characters alpha-numeric + custom passwords (32 or less if the site limits the length to <32). I don't provide a usual name for my favorite pet or mom's name but instead another 32chrs. password. Password managers nowadays are legion and the only effort is in finding the best suitable for our expectations. Concerning the online Pwned Passwords checking I wouldn't check (online) a password I use, but I could test new ones, just to see. After all there's only the user who knows if the password he's checking in elaborated from imagination or factual. If you have 30GB to spare on your HardDisk and you have Python installed (or you are willing to install it), you can download the DB with hashed passwords from https://downloads.pwnedpasswords.com/passwords/pwned-passwords-2.0.txt.7z and my script from https://github.com/STech-Ics/pwnedPasswordsLocal and you can check all your passwords locally, without any connection to Internet. The python script is not so polished, but it works fast and for lists of passwords too. Isn’t this exactly what the Pwned Password wants in order to just grow more its database? To provide them with our passwords by checking them up? Heh we said long time goodbye to sincerity now did we? 2- Curiosity. Submit passwords to evaluate the correlation between their build and their availability on the site’s database… but don’t use those submitted afterwards. I wouldn’t, anyway. In this regard, a good application, filled with information and various detailed password strength analysis, called “Strong Passwords Need Entropy” : excellent IMO. I use a password generator to generate random passwords, a different password for every login*. *I do cheat a little on this — with my own servers and services, I have a single “internal password” that I use to access systems that you already have to be in my VPN to get to. That password gets changed about ever 90 days, and is never used for any other purpose. It’s a compromise, to be sure, but one that I’m OK with since you must have already subverted my VPN in order for it to be useful. I typed the p/w my girlfriend uses and unsurprisingly (since it’s pretty weak), it appears to have been used twice before. I’ll send here the link and hope the result teaches her a lesson. I don’t see any cause for concern for others worried about typing their own passwords on the site since it’s using a EV certificate. While I don’t think this site is unusually risky, I did want to point out the using an EV cert should not give you a sense of security for this sort of thing. You’re still trusting that the site is handling your sensitive data properly. No cert in the world addresses that issue. Apologies for the late response John. I’m afraid I only just received notification of it. I trust that clarifies the matter. I keep wondering what to say to this. Seen it mentioned on a couple forum sites an thought “huh”. Im going to go somewhere else now.